We’ve been busy over the last few weeks working on several new features for inniAccounts. I’ll be the first to admit they’re not terribly exciting, however they’re pretty essential updates for contractors and freelancers who prefer to be as ‘hands-on’ as possible with their accounts. There’s a new option to allow you to edit your chart of accounts. For most customers the default categories are fine, but if you’re a Lite or Plus customer and want more control over the layout of your accounts, check out the ‘Account List’ option on your company’s admin page. If you’re a Premium customer please get in touch to discuss your requirements and we’ll make the changes for you. You can also now make manual adjustments to your accounts without needing to contact our support team. If you’re an advanced user and you need to make manual adjustments to your accounts (often called journalling) you can now do so by using the ‘Adjustments’ option on your company’s admin page. If you’re a Premium customer you won’t need to use this feature as we’ll take care of managing your accounts – if you have any queries please get in touch. We’ve set up the 2010/11 PAYE rates and Capital Allowances ready for the start of the new financial year. There’s nothing major to report here, mainly just the introduction of the new 50% tax bracket for those earning over £150k. We’ll be publishing a blog post shortly on the changes for the upcoming tax year so stay tuned. And finally we’re also been hunting down some gremlins that have been lurking within inniAccounts – we’ve fixed a handful of bugs that have popped up recently. In particular you’ll now find that the available cash figure on your homepage and on the accounts page provides a more accurate and detailed view of your company’s finances. 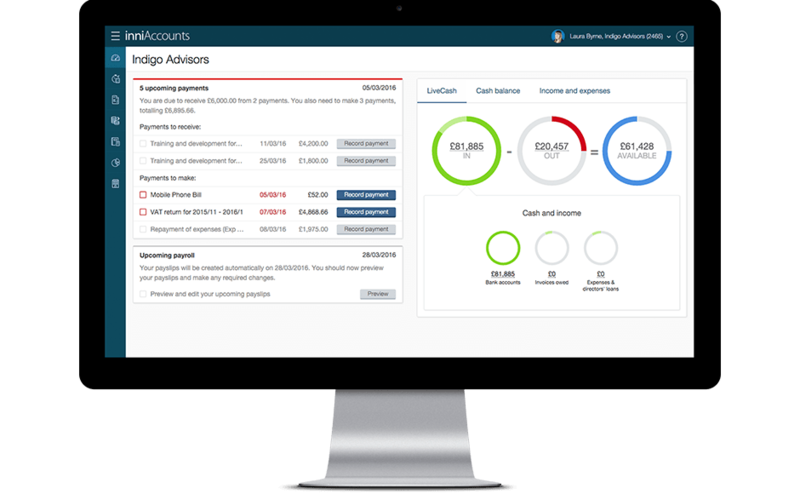 We’re now busy working on our next update for inniAccounts – we’re got some really exciting new features in the pipeline, including a new reporting area designed to make running your business even easier, plus we’ll be giving you the option to download your data into desktop applications – such as Excel – for further analysis. More news on all this coming up shortly.